The journey of this remarkable Salvador Dali, first into being, now into the wider world, has been almost as remarkable as the work itself. The subject of this painting, a gouache, is the Holy Trinity, the vision of God as One-in-Three, Father, Son and Holy Ghost, so it will be useful, I think, to begin with a look at the way Dali approaches Christian imagery in general and the Holy Trinity in particular, one of the most compelling and enigmatic images in the faith. The Holy Trinity was depicted by the great 15th century Russian icon painter, Andrei Rublev, and by such Renaissance masters as Masaccio, Botticelli, Raphael and El Greco. 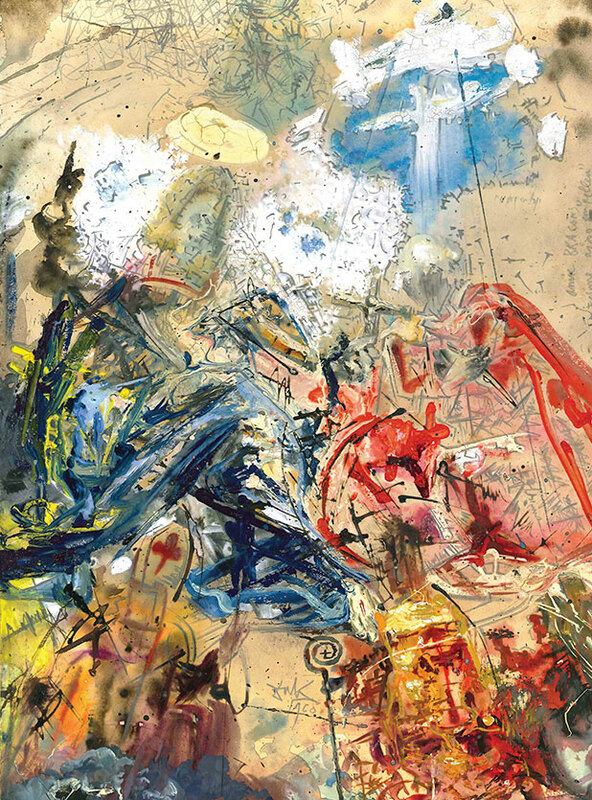 Dali’s treatment of the subject is characteristically fearless, being at once hyperimaginative and – in terms of his own practice – a formal breakthrough. Salvador Dali had channeled the energy of this subjectmatter before. 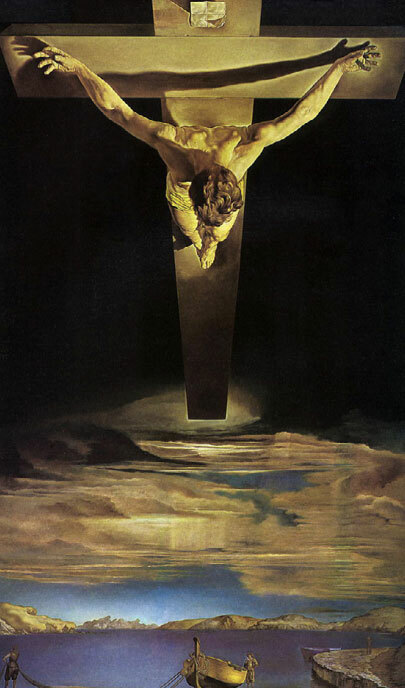 Indeed you could say that the progenitor of the piece is Christ of Saint John on the Cross, which Dali painted in 1951, and which is not merely his own most famous religious image but certainly one of the best-known 20th Century religious artworks by any hand. Dali based it on an extraordinary document, a drawing actually made by Saint John himself after experiencing a vision of the Crucifixion. As re-imagined by Dali the crucified Christ is seen rising above the Bay of PortLligat, a setting of deep meaning for him because he had for two decades been living on and off in a small fisherman’s hut near the bay. Co-incidence can work magic. It was also in 1951 that the Italian government commissioned Dali to illustrate Dante’s Divine Comedy for a lavish publication to mark the poet’s 1965 centenary. Dali made 100 watercolours, that were recreated in woodblocks, to illustrate the religious masterwork and these were put on show in Florence. But when it became more widely known that Italy’s national poet had been illustrated by a Spaniard there was such a brouhaha that the government dropped the project like a hot ember. Once engaged with the subject though, Dali became unstoppable, and he forged ahead, getting the enthusiastic support of a Parisian publisher, Joseph Foret. A colourful character, Foret. Born into poverty in 1901, as a child he had sold cheese from a barrow, moving on to a sequence of such hardscrabble jobs as a mountain guide, a fitter at Michelin and longshoreman, developing into a keen cyclist and astrologer on the side, before becoming a stamp dealer, then a publisher of art books. It was Foret who arranged for the project to be taken over by the publishing house, Editions d’Art, Les Heures Claires, who issued the Dalís as limited edition prints, along with the text in six volumes. This success meant that all the pieces were in place to conclude a more ambitious Foret undertaking: The Apocalypse of St John. It had been in 1959 that Joseph Foret launched himself on this project – the St John being, of course, the Apostle, not the St John of the Cross, a 16th century Spanish mystic - and his plans were to make a single copy of both the heaviest book ever and, at a million dollars, the most expensive. It was edited by Antoine Branducci and the artists commissioned to produce three illustrations included Bernard Buffet, Ossip Zadkine and Leonor Fini and there were texts written by Jean Cocteau and a roster of others Foret, of course, recruited Salvador Dali, and he produced three images for the work. The Apocalypse was duly created and, yes, at 211 kilos it was the heaviest book ever made, with Dali’s bronze cover alone weighing in at 150 kilos. As such the Apocalypse must be recognised as a pioneering example of the sheer ambitiousness that has become a feature of the post-war art world, both in its economics and its aesthetic practice. The mighty volume was toured worldwide for a dozen years, then sold for the desired price. It spent time in Switzerland and Japan, but it is now, the property of a collector, and back home in France. But one of Dali’s images was never included: a vision of the Holy Trinity. Antoine Branducci, the editor of The Apocalypse, had fallen in love with this image on sight - Indeed, it stayed in his private collection until he died in 2015 – and the reasons for its non-inclusion were strictly technical, and arose from the sheer ambitiousness of the project. Quite simply, Dali had produced a tour-de-force that defeated the engraver. This has only added to the singularity of the work, especially given that it is reinforced by such particularities as the double Dali signature, the second being added to the instructions to the engraver, penciled by Dali in Catalan. So to the extraordinary image itself. 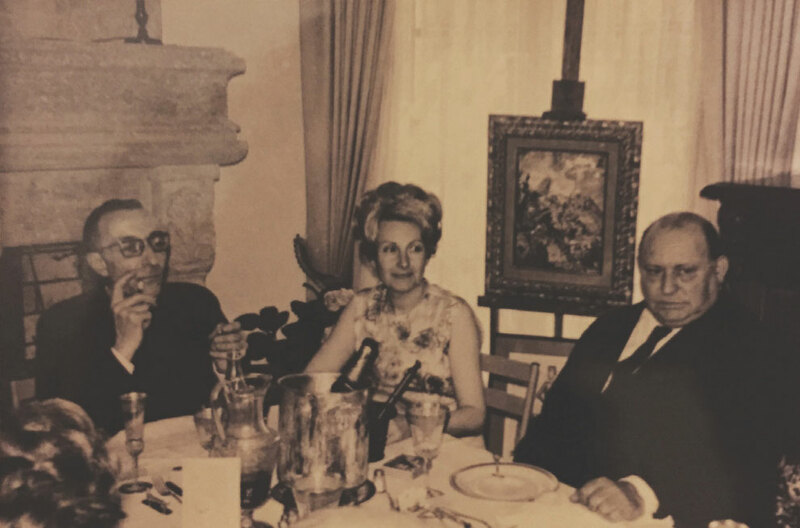 In a book published in the ‘60s Carlton Lake, the American collector and writer, also co-author with Francoise Gilot of Life With Picasso, took note of a conversation with Dali while they were looking at a canvas by a 19th century Frenchman. Dali indicated a patch of paintwork. “Look at this. It might almost be a Pollock,” he said. Dali, no less than Picasso, could feast on ambient energy. In this gouache surely we can see fresh energy coursing through him, hyper charging his pictorial vocabulary. It’s a terrific and deeply mysterious piece.